As you drive the stretch of Highway 49 between Glen Ullin and Elgin, you’ll experience a variety of land features. You’ll see rolling hills, open fields, and great expanses of pasture land surrounded by barbed wire fences and curious cattle. Glorious buttes and cut banks of the area surround and contain the Heart Butte Dam. To say it’s a breathtaking view is an understatement. Highway 49 is dotted by a few farmsteads and grain bins as one would expect from a state with such a strong agricultural backbone, but one part of the drive caught me pleasantly surprised as I found myself rubbernecking and spinning a U-turn on the lonely highway. 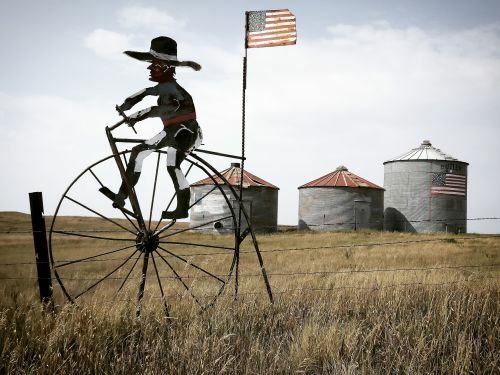 There was a grouping of three grain bins surrounded by a barbed wire fence--which isn’t unusual, but the first bin was painted with an American flag and the last was painted with a Lutheran flag and the fence was lined with a variety of whimsical life-size salvaged metal sculptures. The work was created in the summer months and came as quite the surprise to Dwight. Allen exercised his creative bone later on in life and added a bit of whimsy to rural Grant county motorists.